Please scroll down for visitation/service details as well as link to online directions to the Funeral Home. (nee Edwardsen) Sept. 21, 2018. Age 76 yrs. Beloved mother of Jeffrey Gerloski and Jerome Gerloski. 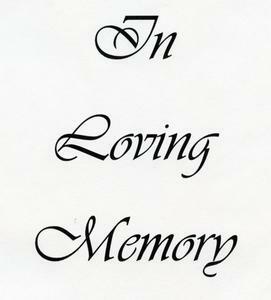 Dear sister of Ervin "Whitey" (Ruth) Edwardsen, the late Audrey (the late Richard) Steffan, Herbert (the late Pat) Edwardsen, the late Richard Edwardsen, and Lorraine Peach. Cherished grandmother of the late Kody, Jerome Jr., Dominic, Charles, and Patricia. Further survived by other relatives and friends. Visitation at the Niemann / Suminski Funeral Home, 2486 S. Kinnickinnic Ave. Milwaukee, WI 53207 on Thursday, September 27, 2018 from 11:00 AM until the time of the Funeral Services at 12:00 Noon. Interment Highland Memorial Park.